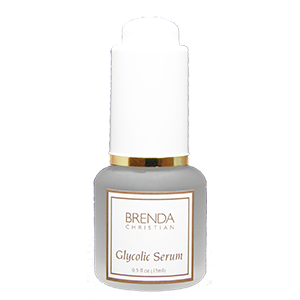 Remove wrinkles, clean out pores with Brenda Christian Glycolic Serum. Pure, unbuffered Glycolic Acid (10%) mixed with Salicylic Acid (2%) and Whole Leaf Aloe Vera dissolve away oil, superficial lining, and dead, dry skin. The result, a gently peeled skin. Imagine a magical nail file which could buff away lines without irritation. That is Glycolic Serum. Wear it at night while you sleep. 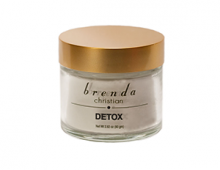 You will awaken in the morning with smaller or vanishing blemishes, less lining, and younger looking skin. This is the perfect peel for at-home use. Use as recommended, (more is not better). Do not use near eyes or on lips. After cleansing, pat dry. Apply three drops of Glycolic Serum to facial area, distributing evenly. Glycolic Serum may be used as a spot treatment for blemishes. This serum is very strong and is used to decongest the skin, remove dead, dry skin cells, and soften lining. Do not apply close to tear ducts and eye area. Dispense two to five drops and distribute over face. Slight stinging sensation may occur initially. Begin using every three days, then the third week, every other day, and if necessary every day thereafter. Unbuffered pure alpha hydroxy acid derived from sugar cane. Plant derived alpha hydroxy acid. Soothing, moisturizing gel with documented healing properties. Glycolic Acid 10%, Salicylic Acid 2.0%. DI Water, Ethoxydiglycol, Whole Leaf Aloe Vera Gel, Hydroxyethylcellulose, Diazolidinyl Urea, Methylparaben.